The Northern Explorer goes from Auckland to Wellington through volcanoes and farmland. The Coastal Pacific goes from Christchurch to Picton along the South Island coastline. 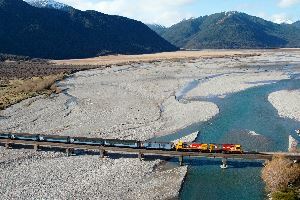 The TranzAlpine from Christchurch to Greymouth travels in the middle of the Southern Alps. Despite the small network, taking the train in New Zealand is a must-do. Each of those three lines have won awards and are well known around the world by train aficionados as some of the most incredible lines still in service. It’s simple: most of those routes pass where a cars can’t. 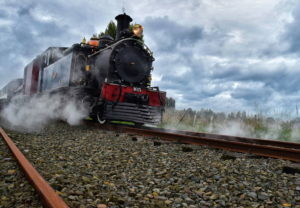 As with most tourist attractions in New Zealand, Kiwi Rail uses the latest technology, such as GPS based system proving commentary available in five languages and HD video. Arrive at least 20 minutes before departure. Your train may depart early if all booked passengers are onboard. The baggage allowance is: 2 items per person and maximum weight 20kg per item. Baggage over 30kg will not be accepted but can be repacked into bags provided they meet the 20kg per item limit. There will be a NZ$10 charge for carrying extra items like surf boards, bicycles or skis. We recommend that you book your bike on in advance. If you are planning on taking the train more than twice, think about taking a Scenic Rail Pass and save money. The Northern Explorer line is a 10+ hour eclectic journey from Auckland to Wellington on the North Island. The line includes 8 stops and operates 6 days a week. It leaves Auckland on Mondays, Thursdays and Saturdays and leaves Wellington on Tuesdays, Fridays and Sundays. The TranzAlpine line is a 4+ hour epic journey from Christchurch to Greymouth on the South Island. The line includes 12 stops and operates daily excluding Christmas day. The Coastal Pacific line is a 5+ hour scenic journey from Christchurch to Picton on the South Island. The line includes 8 stops and operates daily in the summer excluding Christmas day. Be aware that in winter (from May to September) the line only operates 4 days a week: Friday, Saturday, Sunday and Monday.